From what I've seen over the past few seasons, I'd be willing to bet 60% of climbers on the East Coast are using Quarks or Nomics. 30% probably use BD tools, and the other 10% are spread out among Camp and Grivel. I've used both Petzl and Black Diamond tools pretty extensively and find that both work extremely well. Choosing a tool nowadays is like choosing a car - many brands perform well and last a long time. It all boils down to one's own preferences. I suppose this is as much a review and endorsement of BD's more conventional ice tools as it is a Fusion pick review. 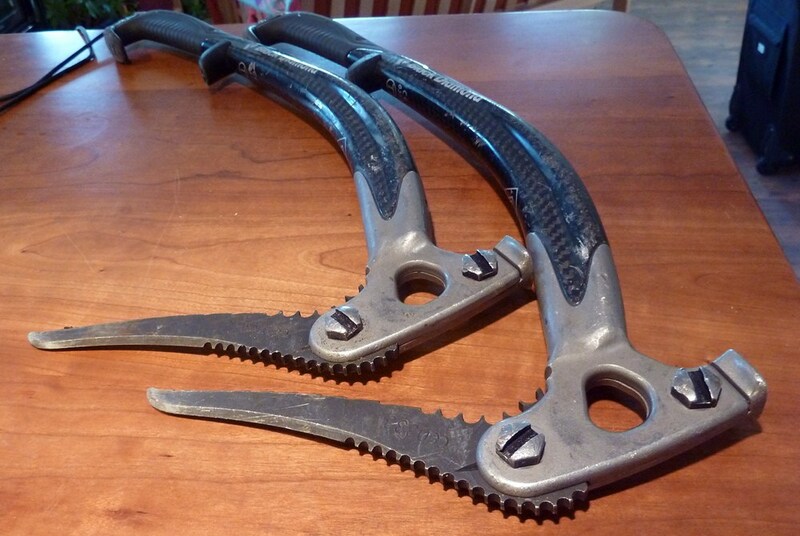 Over the past three or four seasons I've used a pair of BD Vipers or Cobras for all of my guiding and most of my personal ice climbing. When the climbing gets harder or turns to steep mixed terrain I use a pair of Nomics. It's funny, I want to love the Nomics. They swing easily, climb ice and rock well, and have almost no learning curve. I've climbed many new mixed routes in the Catskills with them. However, most days over the past two seasons I've left my Nomics at home in favor of my Cobras. I know, some of you are thinking I'm crazy. I've come to appreciate the stiffness and simplicity of the Cobras. The pick angle is less steep, meaning you need to use more caution on cauliflower ice but once they're placed they feel very solid and secure. They seem to work better on low angle ice and stick easily on the first swing too, once you know where and how to swing them. The stock pick for the Cobra is the Laser pick. It's thin, sharp and displaces very little ice, making it good for really steep pure ice routes. In fact, the Laser pick is so thin and sharp that it can get stuck easily. One needs to be careful not to overdrive the top-heavy Cobra on steep ice. The Laser pick isn't durable though. I replaced my Laser picks with Titan picks immediately last season. I was, and still am, puzzled by the shape of the Titan pick. It's nearly identical to the Laser, but with a chiseled front edge and a thicker profile. Initially, placing the Titan felt like trying to stuff a square block into a round hole. After a bit of filing, to make the Titan look like the Laser, it climbed well. It's like a Laser pick that displaces a little bit more ice. This all makes sense, right? This season I purchased a pair of Fusion picks to use on the Cobras. The Fusion pick is nearly identical in shape to the Laser, with the exception of a thicker profile (like the Titan), serrated top (similar to the Petzl Astro/Rock pick), and a slightly longer front tooth. You'd think, with the near-identical shape to the Laser that they would climb well right away, wouldn't you? Nope. For the first day they were the bounciest picks I've ever used (kind of like the Fusion tool on ice). I was a bit irked. What gives? However, after a few days of mixed climbing the front tooth gradually began to shorten. As this occurred they began working better. Honestly, I'm not sure if they're working better or if I've learned to swing them differently, but I'm loving the Fusion pick. It's the pick I'll be using for most of my climbing from now on. So, if you're using BD tools and feel like your Laser picks are wearing out quickly because you accidentally strike rock once in a while give the Fusion picks a whirl. After a bit of playing you'll barely notice a difference between the two.